Check-Out Card Pick Up — Pick up your check-out card from Terri Fyffe in the Business Office in Center Hall. Each senior must return his completed forms and checkout card to the Deans’ Office no later than Wednesday, May 9, 2012. 8 a.m. - 5 p.m. — Senior Art Exhibition in the Eric Dean Gallery, Fine Arts Center. Graduating senior art majors will display their work, including Evan Bayless, Matt Levendoski, Yangnan Liu, Brandon Doebler, Ben Muensterman, and Kelvin Burzon. Graduating seniors and members of the faculty are invited to breakfast with Deans Gary Phillips and Mike Raters ’85. The starting time will be strictly observed, and dress for the breakfast is collared shirt and slacks. Seniors will move directly from the Deans’ Breakfast to the rehearsal. The starting time will be strictly observed. 4 p.m. - 5:30 p.m. — President’s Reception at The Elston Homestead, 400 East Pike Street. Join President and Mrs. White for a celebration in honor of the Class of 2012 and their families. Seniors and Faculty must arrive at 10:30 am for Baccalaureate and 2:00 pm for Commencement. It takes 30 minutes to line up seniors by name. Be on time and quickly find your place. Seniors march in alphabetical order—led by the two Commencement speakers and followed by the men who are receiving academic honors (also in alphabetical order). At the head of the procession is the Marshal, Professor Frank Howland, who will direct the seating. 8:30 a.m. - 10 a.m. — Cap and Gown Pick Up in the Chapel Basement. Seniors obtain their caps and gowns (provided free by the college). Return caps, gowns, and hoods (received during Commencement) to the same place immediately following Commencement. If you wish to purchase a hood, place an order with the Bookstore. You may keep the tassel from your mortarboard. 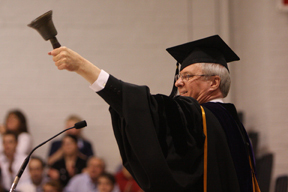 11 a.m. — Baccalaureate Service in the Wabash College Chapel. The Baccalaureate sermon will be given by Dr. Matthew Myers Boulton, who is President of the Christian Theological Seminary in Indianapolis. 12 noon — Commencement Buffet in the Knowling Fieldhouse, Allen Center. A buffet lunch will be served at a cost of $12 for graduating seniors and their families. Complimentary photographs will be taken of your son as he receives his diploma and will be mailed to parents after Commencement. The Media Center will record the event, and DVDs will be on sale in the Bookstore approximately two weeks after Commencement. 3:30 p.m. — Reception for the Class of 2012 in the Great Hall, Sparks Center. Join President and Mrs. White for a reception in honor of the Wabash College Class of 2012.